Imagine yourself an astronaut who is stranded by his group – they think you’ve died and have had to make an emergency escape. Problem – you are not dead. You are a very bright and resourceful engineer who can get into a capsule, repair and jerry-rig much of what you need and hope to live until someone comes back for you – likely with the regular 4 year schedule because they think you’re dead. You manage to get what you need to live going – air, food, water, etc. Then you work on the communications technology – just in case. That’s the situation of Mark Watney – botanist and astronaut. The Martian is generally the first person stream of consciousness of and log of Mark. It generally has a linear chronology, but there are a couple brief sections of back-story. The thing is to watch the dates in the chapters (i.e.- Sol 120) because days and sometimes weeks are skipped. – told in solar days – Mars has a slightly longer day (one sidereal rotation) than Earth. 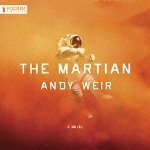 Starting out as a suspense-filled page-turner The Martian never lets up. Along with the stream of consciousness and the log, there are also alternating sections of what’s happening on Earth and in the ship which had to leave Mark on Mars. This is definitely “science” fiction – emphasis on physics and math. It’s kind of a personalized “how to” manual regarding space ships stuck on Mars but even if you don’t understand that sort of thing the general idea of what all Watney is doing and why. Bray’s reading adds to the charge. As I have said on 4MA I found the science to be really boring. I did not finish the book but did Peek to the end to see if he made it back alive. Yes, there were times when the combination of ingenuity and duct tape wore thin. lol – But I enjoyed the premise. I thought this book riveting. It reminded me of the 1960s movie, Robinson Crusoe on Mars. It should probably appeal to anyone who admired the save-the-day engineering of Apollo 13. I’ll bet you’d enjoy Seveneves – it’s along the same lines in some ways – science oriented sci-fi – but with more advanced technology – lots of robotics instead of duct tape.